Houses on the River belongs to an extensive group of urban landscapes that Egon Schiele painted during the course of his career. 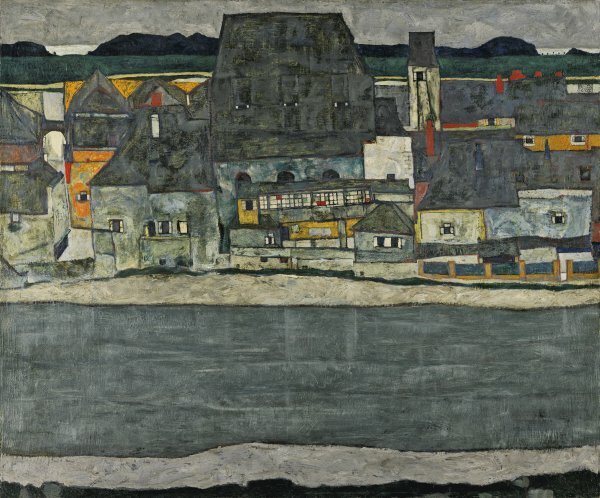 For a long time it was wrongly identified as an urban view of Wachau, a town in lower Austria where Schiele painted on several occasions, until it was subsequently demonstrated that the scene in fact represented Krumau, a small Bohemian village on the banks of the river Moldava (now Cesky´ Krumlov, Czech Republic). After Schiele visited it with his friends Anton Peschka and Ervin Osense in summer 1910, he decided that this village, where his mother was born, was a perfect refuge from hectic Vienna. He settled there permanently in 1911 with his model Wally Neuzil, and its narrow streets, the geometry of its buildings and its medieval constructions soon became one of his favourite motifs. However, this idyllic relationship was short lived. His bohemian and libertine lifestyle brought him serious problems in the provincial and conservative Krumau and he ended up being evicted from his lodgings. The accusations against him continued even after he moved to Neulengback, on the outskirts of Vienna, and he was imprisoned for twenty-four days in 1912 on charges of public immorality. The first owner of the work was the Viennese collector Franz Hauer, whom Schiele, like Kokoschka, portrayed in 1914, the year this painting is dated. It was given by Mr and Mrs Mortimer M. Denker to The Solomon R. Guggenheim Museum in New York in 1965 and entered the Thyssen-Bornemisza Collection in 1978.